BACKGROUND: Worldwide, the prevalence of cardiovascular diseases such as atherosclerosis is on the increase. Younger people may be especially vulnerable owing to their exposure to risk factors such as drug abuse and HIV. METHODS: The thoracic aortas of 149 South Africans under the age of 50 years were collected at the Salt River Mortuary, Cape Town, and examined macroscopically and microscopically for evidence of anomalies. The sample comprised predominantly males, and included black, coloured and white individuals. RESULTS: A significantly higher level of macroscopic pathology was found in coloured males, although overall prevalence of pathology in this sample was lower than expected. A positive association was also found between body mass index and vascular pathology in the black and coloured population groups. Microscopic anomalies were common and present at high levels, irrespective of age and racial grouping. CONCLUSIONS: The widespread prevalence of microscopic anomalies in all groups suggests that these are normal variations that result from haemodynamic forces. The higher prevalence of atherosclerotic lesions in coloured males, however, probably results from specific genetic conditions such as hypercholesterolaemia or lifestyle factors such as diet or tik abuse. The findings suggest that coloured individuals may be at increased risk of developing cardiovascular disease. Certain communities in South Africa have a high potential for exposure to one or more of these recognised risk factors, as well as having a genetic predisposition to hypercholesterolaemia.9 With the high rate of HIV infection and frequently limited access to health care, South Africans may be at increased risk of developing CVD. South African studies indicated that early lesions such as fatty streaks were common in black South Africans, but levels of more advanced lesions were lower than those reported for white South Africans, black and white Americans, and European populations.10,11 It has been suggested that this could be due to lower dietary fat intake and lower serum cholesterol levels in black South Africans. 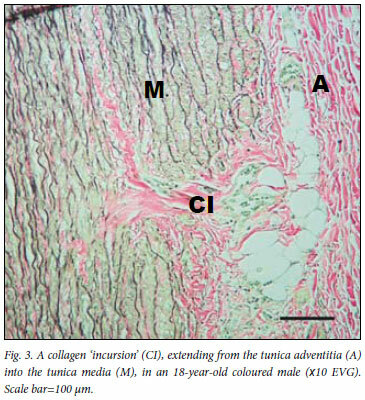 In an autopsy study on atherosclerotic disease in Cape Town, it was found that black and coloured individuals had high levels of moderate to severe atherosclerotic lesions, and that advanced lesions were most common in those younger than 50 years.12 Although our study suggested that the distribution pattern of atherosclerosis is undergoing transition in South Africa, only 58 individuals aged between 14 and 95 years were examined; and of these, 11 were older than 50 years, and only 2 were younger than 20 years. Segments measuring 2 -3 cm in length were removed from the aorta, between the aortic arch and the diaphragm. Where the aorta appeared normal, random segments were taken. In cases of macroscopic pathology, segments included the sites of lesions. The segments were placed in jars containing 10% neutral buffered formalin and labelled with the case file number and date of collection. Each segment was then divided further into 3 sections for histological processing, 2 of which were processed and embedded into a single wax block. The third section was dried and embedded into Tissue Freezing Medium (Leica Microsystems, Nussloch) to determine the presence of lipids. Sections with a thickness of 5µm were obtained from each wax block on a Reichert-Jung Autocut 2040 microtome and were processed further using 3 different staining techniques: haematoxylin and eosin (H&E) to assess general vessel architecture; alcian blue pH 2.5-Periodic Schiff reactions (AB-PAS), for presence of neutral and acid mucopolysaccharides in the arterial wall; and Elastin von Gieson's (EVG) for morphology of elastic tissue, collagen fibres and smooth muscle throughout the vessel. Sections embedded in Tissue Freezing Medium were sectioned on a Leica CM 1850 cryostat, fixed on APTESE (Merck, Germany)-coated slides, and allowed to air-dry. Slides were then stained with Oil Red O (ORO). For each of the macroscopic and microscopic categories of 'Normal' and 'Pathology', data were analysed regarding race, age and body had been estimated. BMI was calculated and individuals assigned as underweight <18.5, normal 18.5 -25, and overweight or obese >25, as specified by the World Health Organization.23 For children less than 2 years old, baby percentile charts were used to determine BMI. The age category with the lowest percentage of macroscopic pathology (20%) was the 0 -19-year group, and the highest (44%) was the 20 -29-year group. Black individuals in the 0 -19-year group showed the lowest percentage (16%) of pathology, while the highest percentage (39%) was in the 20 -29-year group. Macroscopic pathology was observed in 40% of coloured individuals in the 0 -19-year, 57% in the 20 -29-year, 45% in the 30 -39-year and 62% in the 40 -49-year group. Regarding race and BMI, 27.3% of normal and 38.2% of overweight black individuals showed evidence of macroscopic pathology, and 47% of normal BMI coloured individuals showed macroscopic pathology - almost twice that of the corresponding black group. Two-thirds of overweight coloured individuals had evidence of macroscopic pathology, as did 50% of those underweight. Our findings indicate that prevalence of macroscopic pathological lesions in the thoracic aorta is significantly higher in the coloured population than in the other population groups examined. These results, consistent irrespective of age and BMI, support the findings of the 2006 study12 and suggest that coloureds may be at greater lifetime risk of developing atherosclerotic disease. The higher prevalence of atherosclerosis in the coloured population may be attributable to several factors. 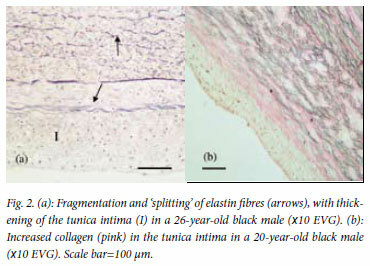 Familial hypercholesterolaemia that predisposes individuals at a young age to the development or accelerated progression of CVD is a relatively common disorder in South African coloured and white Afrikaner populations9 and could account for the presence of advanced atherosclerotic lesions in coloured individuals below 50 years of age.12 Coloured men and women have the highest levels of cigarette smoking in South Africa - a known risk factor for CVD.13 In the Western Cape, there is high and increasing consumption of methamphetamine hydrochloride (crystal meth), known locally as Tik. Most Tik users are coloured males under the age of 20 years.14 Tik use among coloured females is reportedly higher than among their black counterparts.15 Tik has been linked to high blood pressure, irregular heartbeat and damage to blood vessels of the brain, resulting in stroke,14 and is implicated in other cardiovascular conditions such as aortic dissection, coronary artery atherosclerosis, and aortic degenerative changes.16 Abuse of Tik can lead to high-risk sexual behaviour, exposing users to greater risk of HIV infection.14,16 The age group most at risk for HIV infection in sub-Saharan Africa is that of 20 - 39 years.17 HIV and antiretroviral treatments (ART) have both been associated with pathological changes in the cardiovascular system, including atherosclerosis.7,16,18 Our high prevalence finding of atherosclerotic lesions in coloured and black individuals in the 20 - 29-year age group suggests that some might have been HIV-positive or receiving ART. Almost 90% of individuals in this study were positive when analysed for the presence of acid mucopolysaccharides, which have been linked to non-atherosclerotic CVD such as intimomedial mucoid or cystic medial degeneration.21 Acid mucopolysaccharides have been associated with damage to elastin and an increase in collagen in the tunica intima and the tunica media,22 as frequently observed in this study, and which can result in vessel wall dysfunction. 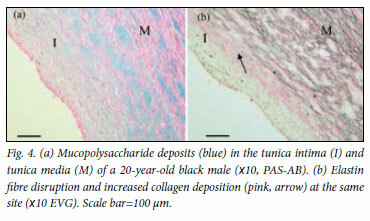 The widespread presence of microscopic structural disruptions in the aortic wall across all age and racial categories and in macroscopically normal individuals does, however, suggest that these changes are physiological rather than pathological in nature. Disruptions to elastin and high densities of collagen, for example, occur in response to haemodynamic forces and may be related to vessel wall repair processes.23 Affected areas might, however, function as nidi for the subsequent development of lesions in the vessel wall.